When the 2010 season closed off for us, it was a slight disappointment in the sense that we suffered a mechanical failure headed into the hairpin at Mosport International Raceway where we flat-spotted a new set of tires. We immediately recognized the need to keep better maintenance records of consumables and the on track hours we are putting on specific parts, such as the wheel bearing that failed. In terms of constant progression and bettering ourselves, we often look to the experience of our consultants and advisors, which is why we align ourselves heavily with pro teams. 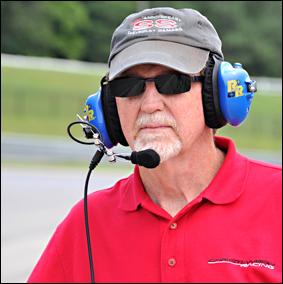 Mark gets a great blend of professional race instruction from a combination of winning NASCAR, Grand-Am and ALMS drivers. There are so many different considerations on and off the track that require our attention, all of which contribute to a better bottom line: a more successful race team. 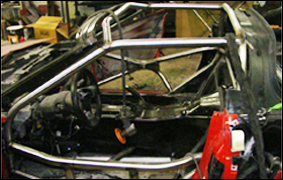 Previously the decision was made to proceed with the steel frame chassis for various reasons, and during the off season, the car went under the knife once again to have the roll cage installed - the primary reason being driver saftey. 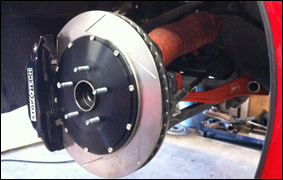 We've had great success with the Carbotech pads we have been running and 2011 will see a significant upgrade to our braking systems. We've chosen to continue with Carbotech pads for their great performance, however, we are making the full switch to the StopTech big brakes, where we will be running 380mm in the front and 355mm in the rear. This will allow Mark to run hotter and deeper into the corners, complimenting his driving style. Our efforts to lighten the car will include the additional use of more carbon fiber such as the front fenders, for example. We've removed as much excess weight off the car and we're expecting a noticable difference once we get back out there. 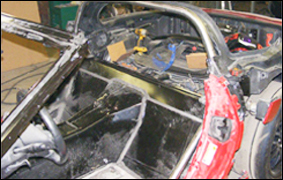 The conversion to the wider body will bring additional changes down the line for us in several ways. For example, we will be switching to a lighter and wider racing wheel. The CCW SP20s have served us very well and we will be continuing with CCW, however, to accomodate the larger brakes and gearing up for competition, we're switching to the CCW C10 wheel. Every little bit helps and should translate into faster lap times for us.